Crown Prince Mohamed bin Salman Tuesday projected a new monarchy free of extremism and open to modernization as the country engages in reforms. 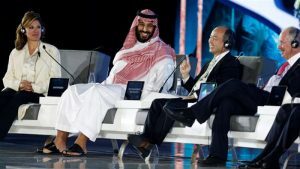 Speaking to delegates at Future Investment Initiative in Riyadh the Crown Prince, also known as MBS abroad, said Saudi Arabia will return to its past of moderate Islam, open to all religions. “Saudi Arabia was not like this before 1979. We want to go back to what we were, the moderate Islam that’s open to all religions. We want to live a normal life,” he said. The 32-year old Prince and the next king in line is directing country’s changes enshrined in the 2030 vision aiming at diversifying the Saudi oil-dependent economy and open up for more foreign investment. The kingdom, despite being a key US ally has been criticized for its radical Islam and control on human rights. Crown Prince Mohamed has introduced several reforms in the area of economy with the promotion and launch of mega tourism projects seeking to attract foreign tourists. The entertainment industry has also received a royal boost. To show its keenness to improve human and women rights, the kingdom last month lifted the ban on women driving. Officials said the removal of the ban is not just social but also economic. Alongside the move to open up to the rest of the world, Saudi Arabia is also developing a nationalistic policy to boost participation of young Saudis and local companies in the growth of the world largest oil producer. Local businesses, SSMEs now have a fund worth $1.6 billion that they can tap into to develop projects and consequently contribute to the country’s GDP. Written by: KanelkaTagba on October 25, 2017. Posted by KanelkaTagba on Oct 25 2017. Filed under Gulf News, Headlines. You can follow any responses to this entry through the RSS 2.0. Both comments and pings are currently closed.